Take advantage of the friendly, casual look of a hood with this lace cardigan. 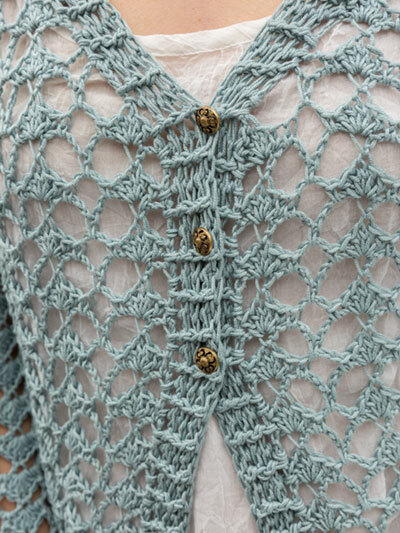 Shells, chain stitches and a 3-button closure at the top give this cardi an easy swing. Crochet with 5 (5, 6, 6, 7, 7) balls sport-weight Premier Cotton Fair in the color succulent using a U.S. size H/8/5mm hook. 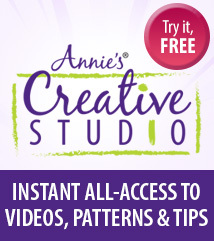 Design by Tammy Hildebrand for Annie's Signature Designs. Bust: 35 3/4 (40 1/4, 44 3/4, 49 1/4, 53 3/4, 58 1/4)"
This is the best written (and edited!) pattern I've purchased from this site. The counts are all spot on. The only issue I had with it had to do with the gauge - I have to go up to a 6mm hook in order to even come close.